ZeoPet — a complex nutritional supplement for pets. It’s produced from a high-quality, natural mineral – zeolite – in a special spatial configuration: clinoptilolite. ZeoPet is an effective natural sorbent, ion exchanger, and catalyst. When zeolite enters the animal’s digestive tract, it improves the excretion process of dangerous low-molecular waste and toxins and normalizes and enriches mineral metabolism. Zeolite’s structure resembles a ‘mineral sponge’ that is capable of removing potentially pathogenic inorganic components from the animal’s body, while also enriching and stimulating mineral metabolism. Improvement of the digestive system, which assists in the complete digestion of food. General improvement of the immune status and increased resistance to certain diseases. Normalization and enrichment of the mineral balance, which becomes visible in the improved quality of skin and fur. Prevention and protection of the animal’s liver and kidneys from the destructive effects of mineral imbalance and toxic impact low-molecular free radicals, as well as certain chemical preservatives that are selectively present in some feline foods. 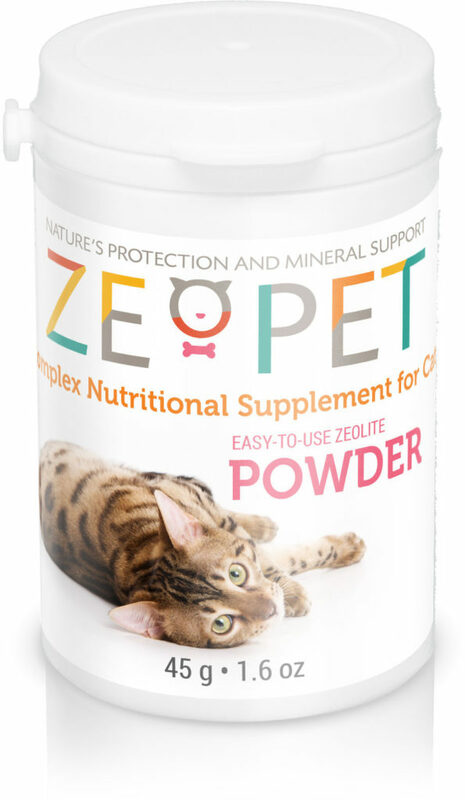 In combination with its mineral components, Zeolite’s effect as an efficient sorbent (cleaner) can have a positive effect on the animal’s lifespan. Mix into cat’s food once a day immediately before feeding.